A drive to Mount Edith Cavell, in this Canadian Rockies park, is a truly unforgettable experience. Glaciers, lakes, icebergs, waterfalls and epic peaks. All in one little area. Truly astounding. I went inside this cave; it’s cool and wet because lots of water drips from the ice. 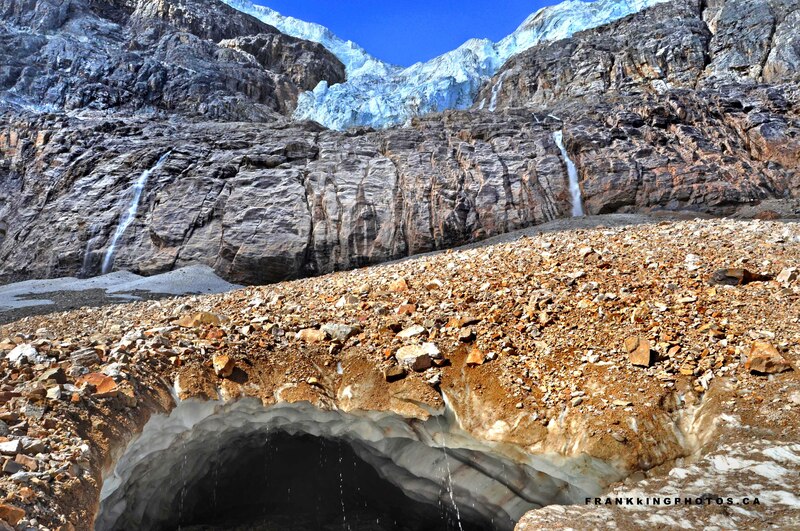 (Here’s a different view of Angel Glacier and, if you look carefully, the ice cave: http://wp.me/p2ccTX-jU.) This photo was made in 2011; since then, access to the area has been prohibited because pieces of the glacier can break off and kill people. Wow, that cave is really cool.